Today is Reader Sample Schedules Day. These posts are among the favorite on this blog. Take a moment to fill comment on the post where your child is currently. So if you have a 13 month old, head to the 12-24 months old post and share your current schedule. If you remember other schedules at different ages, feel free to fill that in as well! Here is what you do. Click on the link to the post you want to add a sample schedule to. Then add a comment with your sample schedule. 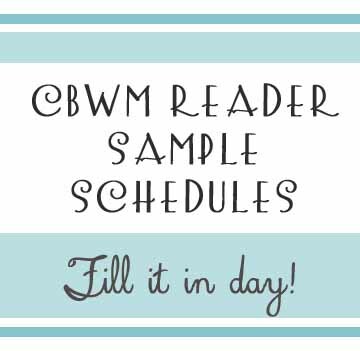 Then future moms can come look at these sample schedules to get ideas for their babies and children! If everyone took a moment to share their schedule at this very moment, it would add a whole lot of ideas for future moms! There are some posts that definitely could use some attention–one is the 5-8 year olds…because there are only a few right now! Another is the Summer Schedules post–I started that last year and it needs a lot of filling in. I also started a 9-12 year old post today, so if you have a child in that age range, check that one out (it is right below this post).